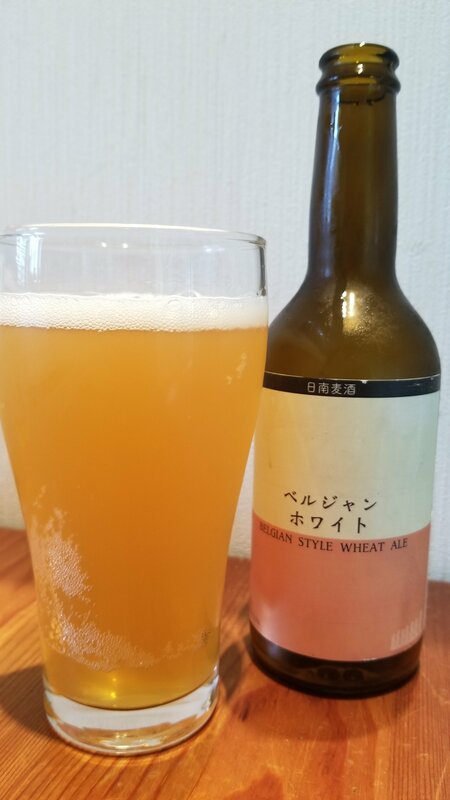 Nichinan Beer Belgian Wheat Ale is a 5.5% witbier from Nichinan Brewery, based in Miyazaki, Japan. It’s part of their all-year round range of beers and can be found in bottles in Miyazaki. Nichinan Beer Belgian Wheat Ale is brewed using rock sugar, marmalade (a first for me on BeerTengoku), coriander, and orange peel. A real eclectic mix of adjuncts going on here. Nichinan Beer Belgian Wheat Ale poured out a hazy orange juice-like colour – but it is not a NE IPA, even with all the wheat in the beer! There was a prickly orange aroma to it with a creamy funky nose to it as well. It had a slight wheat and coriander kick to it once it had warmed up. The body to Nichinan Beer Belgian Wheat Ale was sweet. I couldn’t get over how much of sticky orange body it had. The subtle funky yeast flavour wasn’t off-putting but it felt off due to the bold flavours going on in this beer. It finished off with a yeast kick to it that faded fast. Nichinan Beer Belgian Wheat Ale didn’t really do it for me – a bit sickly sweet for my liking for a wheat beer.